10.5" x 5.5" expanded vinyl check/zipper wallets. Secure your checks and notes with these long-lasting wallets, many color choices. One-color imprint charge: $35.00, but FREE on orders of 100 wallets or more. For imprinted bags, click on custom imprint button, then forward desired text in a separate e-mail, or attach a digital file, and send to: orders@usbanksupply.com. Production on these bags is approximately 10 business days. For quick ship bags see size 6 x 11, item number USCW11X6EV in selected colors. Colors may be combined for quantity price breaks. For mixed color orders of less than 10 bags per color a $1.00 per bag mixed color fee will be added. 10.5" x 5.5" expanded vinyl check/zipper wallets. Secure your checks and notes with these long-lasting wallets, many color choices. 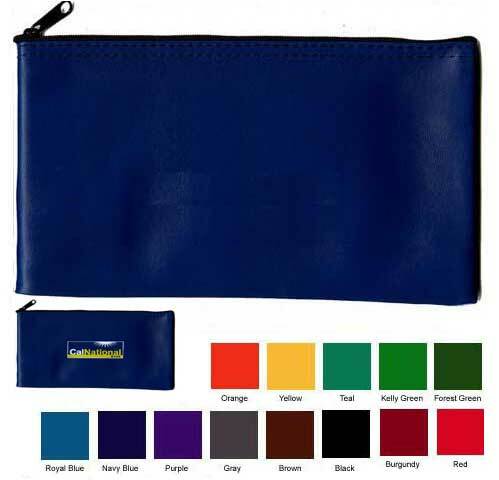 Free one color imprint available on orders of 100 wallets or more.